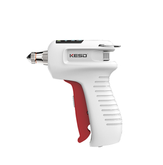 The ion gun is a hand-held static eliminator. Easy installation, stable operation, strong wind speed, static elimination and rapid dust removal. The ion air gun ionizes the air around the air needle of the air gun head into a large number of positive and negative air masses through a high voltage generator, and then blows out through the high pressure air stream to neutralize the electric charge on the object.